Nephrite Hetian White Jade Kwan-yin Statue 和田白玉. Jade of high purity and smooth surface. We do our best to honestly report condition. Qing dynasty (1644-1912) exquisite Boxwood 黃楊木 kwan-yin statue. All images are original. Qing dynasty (1644-1912) exquisite Boxwood 黃楊木 kwan-yin statue. Note: A small chip on the left hand side of the statue. This is due to normal wear and tear. All images are original. A beautiful addition to your collection! The back and the ribbon at the front can be removed from the kwan yin statue. Ming dynasty (1368-1644) exquisite Tibetan kwan-yin statue. This beautiful statue is made of bronze coated with gold. All images are original. Song dynasty (960-1279) exquisite guan yin wood statue. There are natural ageing marks on the statue. Very rare to find large wood guan yin statue in the market. All images are original. Tibetan Buddha Statue. Made of gold and bronze. All images are original. We do our best to honestly report condition. These exquisite artworks are carved from natural stones. It is seemingly a wonderful flower in the garden of Chinese arts and crafts. It integrates traditional poetry, calligraphy and painting, creating many fine masterpieces. This is an antique collection from Tang dynasty, Thes stone is in good condition. Very rare to find in the market. A chubby face of the kwan-yin. which is a typical carving style of Tang statues. Chinese White Stone Kwan-yin on Lotus. Late Qing dynasty (17th to 18th century) exquisite Hetian nephrite yellow jade kwan-yin statue. High purity jade and translucent under light. A cool sense of touch. All images are original. Ming dynasty (1368-1644) exquisite Tibetan dragon statue. This beautiful statue is made of bronze coated with gold. All images are original. Ming dynasty (1368-1644) exquisite Tibetan Buddha statue. This beautiful statue is made of bronze coated with gold. Crystal amulet at the top of the statue, and gemstones all over the status (note that this is an antique collection, there are a few and insignificant missing gemstones). Nephrite Hetian White Jade Kwan-yin Statue with Lotus 和田白玉. Jade of high purity and smooth surface. All images are original. Ancient Chinese characters can be found on the surface. It was probably a collection for the royal. All images are original. All images are original. We do our best to honestly report condition. Custom wood stand. Pure and Clear Crystal Kwan-yin Statue. Size for each statue: 22.5cm 6cm (8.9" 2.4"). All images are original. 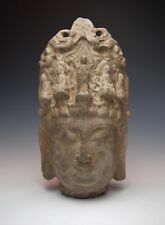 Old Chinese Nephrite Hetian White Jade Kwan-yin (和田白玉). This Hetian jade is examined and certified as top quality nephrite. Natural pure white jade with brown jade skin. We do our best to honestly report condition. Missing hands. Fine age cracks throughout and old wormage (see photos), but overall a nice solid piece. Ex: Phillipines Collection. This is a very unusual stone carved Guanyin statue. It appears to be quite old and displays very well. JUROJIN WITH CHILD ASTRIDE TURTLE. AUTHENTIC "OF THE PERIOD"QING DYNASTY KANGXI ERA. QING DYNASTY REIGN MARK DEEPLY CAST IN BOLD RELIEF ON BASE OF STATUE. THIS EXQUISITE RELIC IS FINELY CAST AND HIGHLY DETAILED. The entirety is utterly magnificent. Beautiful sculptural form with a strength of presence. Impressive from all the way across the room. See photos for all of the superb detail. EXQUISITE CHINESE CARVED STONE GUANYIN. Beautiful Antique white porcelain Guan Yin statue. All antique I found them in most 100 years Old house Old estate and all from old people collection in USA. Be sure to see all photos below enlarged for condition and details. .54"H x 17"W x 13" DEEP. WEIGHTS 52 LBS. Normal wear with age. You will receive the exact item shown above. I'm glad to introduce this, From the pictures, you could see it is very nice, high collection or as a gift to your friend! I am quite glad to help what I can.